On June 2nd, 2014 Apple announced (among other things) a new home automation platform dubbed HomeKit! HomeKit is brand new. As such, some things aren’t yet known, like how popular it will be with accessory makers or whether it will take off with homeowners. The next major event concerning HomeKit is Apple’s annual MFi summit in China this November, where Apple will brief device-makers on HomeKit and other upcoming Apple technologies. Support for HomeKit rolled out in iOS 8 this September and there’s more on the way. In the meantime, let’s talk about what we do know about HomeKit. If you’re a developer, HomeKit is a framework (here’s the documentation) that enables third-party developers to discover accessories, add them to a database of devices, edit, display and act upon data stored in the configuration database, and communicate instructions to the connected devices. If you’re a homeowner, HomeKit is what will enable you to control all of your “smart” accessories from one app. Some manufacturers of “smart things” such as thermostats and other appliances have stumbled in the app development department. Opening app development up to third parties could result in some high quality, fully featured apps for end users. There’s almost no limit the variety of devices that could potentially be controlled by HomeKit. Garage doors, security systems, cameras, lights, switches, electrical outlets, major home appliances are all candidates. HomeKit supports multiple homes so you can keep an eye on the temperature and status of various accessories at your office, Grandma’s house, and your gorgeous lake cottage (which is gorgeous, by the way – please have us over sometime 🙂 ). There is also the concept of a “room”, so you can define areas like “upstairs” or “garage” or “front porch”. You can then say things like “Siri, dim the lights upstairs” or “Siri, turn off the lights in the garage”. If you’ve defined these areas, you can control them independently. Heck, you can even dig into the characteristics of a single accessory. A ceiling fan has a number of settings you might want to adjust without getting up to pull the chain or flip the switch. From your app, you could control the lights and the speed independently of one another – it’s not a matter of just “on” and “off” for accessories. Of course, only devices that conform to HomeKit’s standards will be able to join the party. Hey, Siri, I’m coming home! First of all, HomeKit will centralize control of the various smart devices in your home. Currently, every new device comes with a new app to download and open up every time you want to do something. With HomeKit, developers can offer an app that lets you close your garage door, dim your lights, and turn off your dryer from one app. Second, HomeKit enables the “grouping” of devices so that they can perform as a herd rather than as individuals. Instead of scheduling and programming each device individually, you could set up one “coming home” routine. The app recognizes you’ve re-entered a geofence and responds by turning on your home’s lights, unlocking the front door, and turning up the heat. It’s like going from playing a solo to conducting the entire orchestra! Getting rid of the cumbersome app-switching problem will do a lot to help the smart home concept take off in the coming years. HomeKit may also take the burden of developing a great companion app off of manufacturers of thermostats, lighting systems, and locks and let them go back to focusing 100% on making quality hardware. HomeKit is still very new and manufacturers are only now just announcing their intents to create compatible devices. More accessory manufacturers are expected to announce their HomeKit support after the November 2014 MFi event. 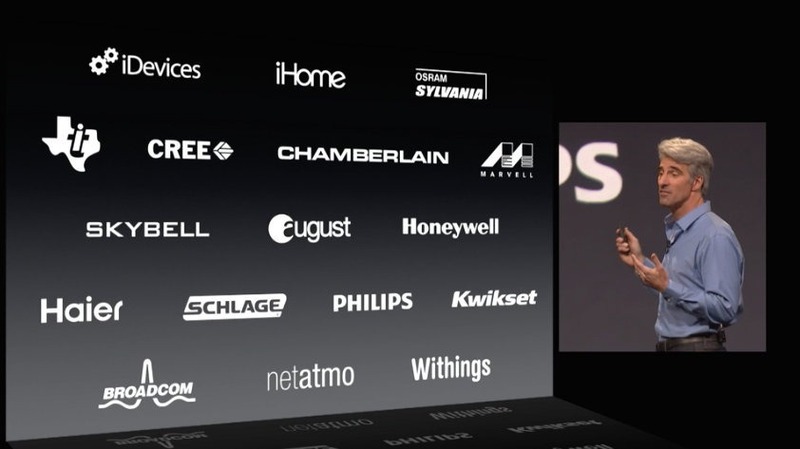 Craig Federighi, Apple’s SVP, presenting HomeKit and a list of partners. Apple isn’t the first to try to tie devices together. SmartThings (recently purchased by Samsung) and IFTTT (“if this than that” recipes for your smart devices) have already made inroads at the kind of automation HomeKit hopes to achieve. However, Apple is pretty well-poised to own the home automation market thanks to iOS’s massive install base and high standards of quality from third party apps. It is expected that more manufacturers will hop on board the HomeKit wagon and announce products after the November summit or in the coming year. Of course, Google is also a player in this game. Google is developing a similar system called “Works with Nest“. The name might be a little misleading, Nest is just the flagship product in what will likely become a more all-encompassing home automation network. Works with Nest has already welcomed Dropcam, Mercedes, and Whirlpool into the fold. As someone who endured the Mac vs. PC format war in the 90’s, I sincerely hope we don’t end up in a new era of this vs. that with entire homes full of appliances in the balance. I’d hate to rip out my new home’s lights and dishwasher just because the previous owner was a “Works with Nest” Android guy and my family is toting HomeKit enabled iPhones. The success of the smart home depends on compatibility and accessibility. HomeKit and other automation platforms will only survive and go mainstream if they aren’t too restrictive. The ideal automation network is secure but able to be passed on to a new owner, sophisticated but not exclusive to a particular smartphone platform, and the accessories should remain operable even in absence of access to the app that controls it. After all, nobody wants to live in a house where you can’t turn the lights on until you find your phone in the dark.